Dizzy Working Mom: The Royal Baby Revealed! 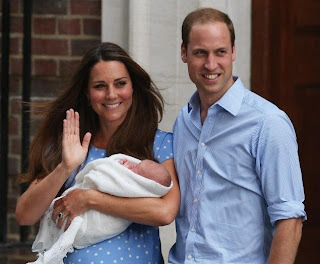 Just saw a video of the royal baby (RB), Kate and Will here. I was excited about RB before, but this video made me love them and get even more excited for a couple of reasons. First, Kate did not try to hide her post-baby bump! I remember when I was six months pregnant with Ben. Dan and I were doing a road trip somewhere and chatting about the future delivery. I said to him, "You know that after I have the baby, my stomach won't immediately go down. I'll still look six months pregnant for a bit. I'll look like I do now." Dan - "WHAT?!?!?" Seriously, he was in shock. I am so glad I told him in advance. Anyways, Kate looks great! Almost no one famous shows their post baby bump. I bet she didn't have much of a choice about making the appearance the day after, but she still wore a dress that emphasized it and seemed like it was no big deal. Second, Wills has changed a "nappy!" Good for him! I am sure that he has a bevy of people that would do it for him, but he chose to do it himself. I can't imagine his dad went within 5 feet of a dirty diaper. Ben was in the NICU when he was born (but was full sized), and I had to be basically forced to change his diaper the first time. And it wasn't until a couple of days after he was born. I am looking forward to hearing what they name him. Dan cannot understand the excitement surrounding RB, and it is hard for me to explain it to him. I guess babies are exciting in general. Add royalty to the mix, and it's pandemonium. Especially for this little guy, who is now in line to be king in the highest profile royal family in the world. Yay babies! I heard on the news that they will not be using any nannies... If that's true kudos!